Donati are our primary brand of Jib Cranes and also offer Wire Rope and Chain Hoists. Donati are a medium sized brand based in Italy with offices in the UK for trade sales and support. Cranes-UK offer the full range of Donati Jib Cranes which are made to your specifications in Italy and shipped directly to you ready for installation. Not only do we offer new Donati equipment we also offer Used Donati Overhead Cranes and Jib Cranes as well as spare parts to suit. Articulated Jib Cranes and Swing Jibs from Donati. Articulated Jib Cranes are perfect solutions where the Jib arm needs to reach around a permanent object it its way such as a supporting column for the ceiling, the split arm enables the user to guide the crane around an object by pushing or pulling on either two of the sections of the Jib arm, this can be done with and without the load on the hoist. Particularly useful in confined areas, arms can span up to 7m in length split over two separate beams connected by a pivoting hinge. Our range of Articulated Cranes features the latest technology in lifting and a neat cable management system that hides all cabling to the hoist in the jib arm preventing any accidental snagging while also improving the overall look of the crane, this also saves the need for a festoon cable management system bringing the end price down. 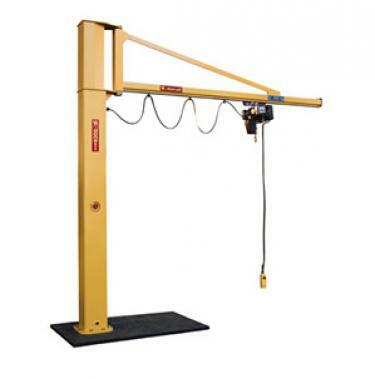 Not only used for suspendidng electric or manual chain hoists the Articulated Jib Crane is often used to support tool balancers and various types of air hoists. Cranes-UK provide a full installation and commisioning service on the whole range of Jibs on a nationwide basis and on special request; internationally. Installation of Jib Cranes and Swing Jib Cranes up to 5 Tonnes. Nation-wide service, enquire today for best prices and short notice availability. Our services go beyond a simple install, we are able to fully test and commision all types of Jib Cranes as well as setup maintenance for the future to ensure your crane stays in tip top condition. Our friendly engineers arrive at site fully equiped to proffessionally complete the job and are able to use our range of lifting equipment to economically but safely install your crane on site exactly where you require. For particularly bespoke applications for example where the floor is particularly thick and made from a seriously hard marterial we also offer our special services such as diamond drilling and excavation. Our experience is vast and streches deep in to the Nuclear Industry so rest assured Cranes-UK will Install neatly and proffessionally with a smile. 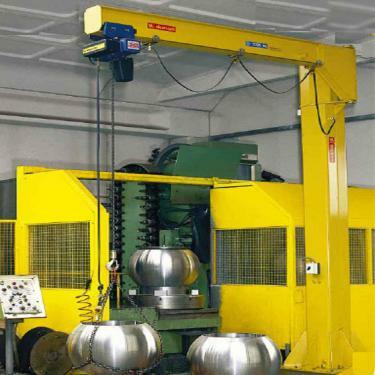 Under-braced Jib Cranes and Swing Jibs from Donati are manufactured to achieve maximum hook path in applications where there is little headroom. The extra space is made by reducing the overall height of the crane. This is achived by supporting the Jib arm from underneed as opposed to from above. This more compact version is not as cost effective as free standing options and does not feature an enclosed hoist trolley or power cable trolleys, instead they run along an "I" beam which is supported by an under bracing. The Under-braced Jib Crane is ideal for installing under low ceilings or areas where the is an overhead obstruction. 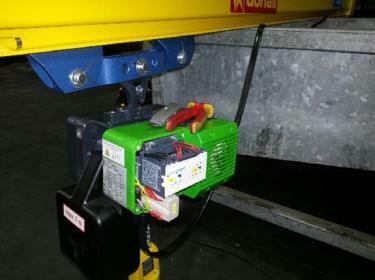 This allows the crane to pick the load up to the highest possiable position in that enviroment, we can also offer ultra low headroom hoists to compliment the crane and provide even further hook path and height of lift. 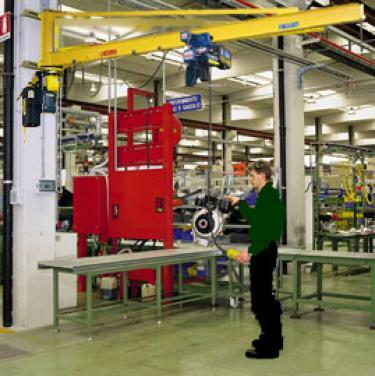 Free Standing, floor mounted or Pillar Jib Cranes and Swing Jibs from Donati are excellent quality examples of Industrial Jib Cranes manufactured to ISO 9001:2008 quality standard on a large scale to achieve maximum economies of scale which are passed on to the buyer. Choose between an modern and sleek integral system or the traditional "I" beam setup with integrated power feed system and mains isolator. Each crane is finished with a varnishing treatment which includes the application of Yellow paint with a base coat thickness of 40 microns and a top coat thickness of 40 microns which was subject to an intense preparation process when metallically sandblasted with SA2 grade. Special Anticorrosive Paint is an optional extra. Donati DGT Drive Units are designed and built specifically for lifting systems which run on rails, such as Gantry Cranes, Travelling Cranes or the running trolleys which are used with cranes. They’re available in capacities up to 40 tonnes. The Donati name is one of the most well-known in the crane industry, and it has become synonymous with quality, reliability and value. The company provides both full crane systems and individual components, offering modern and dependable lifting solutions across the board. We are proud to work with Donati and to supply their highly popular drive units because this enables us to offer our customers excellent value for money. Cranes-Uk are dedicated to making sure that the systems we provide are the most up-to-date and dependable around, so you can rely on us as your all-round supplier of spare parts and components after you’ve purchased your crane. 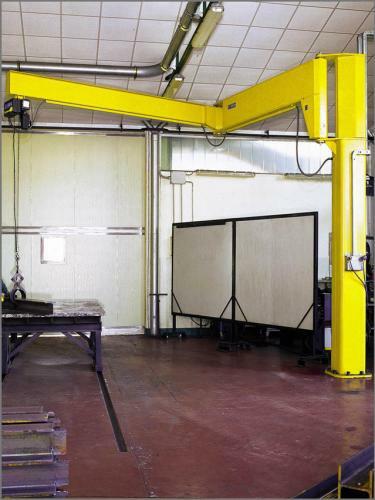 We’ll keep your systems working to their full potential and can offer valuable upgrades to lifting equipment. The key features of Donati DGT Drive Units are as follows: Capacity of lifting equipment: 1,000kg-40,000kg Running speeds: Single Speed: 3.2 to 25 m/min Dual Speed: 12.5 & 3.2 to 80 & 20 m/min Standard double flange wheels, available in various driving band widths on request Smaller sizes are made of carbon steel Larger sizes are iron casted and revolve on radial ball bearings that are permanently lubricated. 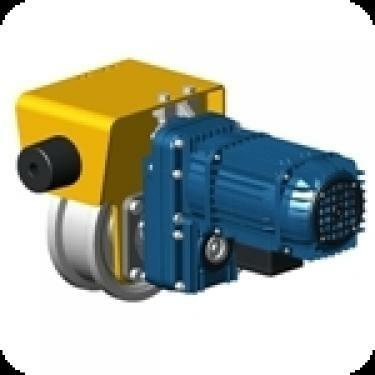 Units are available either in idler operation, or as drive units in combinations with an offset geared motor.